The Deep Sea Fishermen’s Union of the Pacific is the only union in the United States that represents the concerns of crewmen. 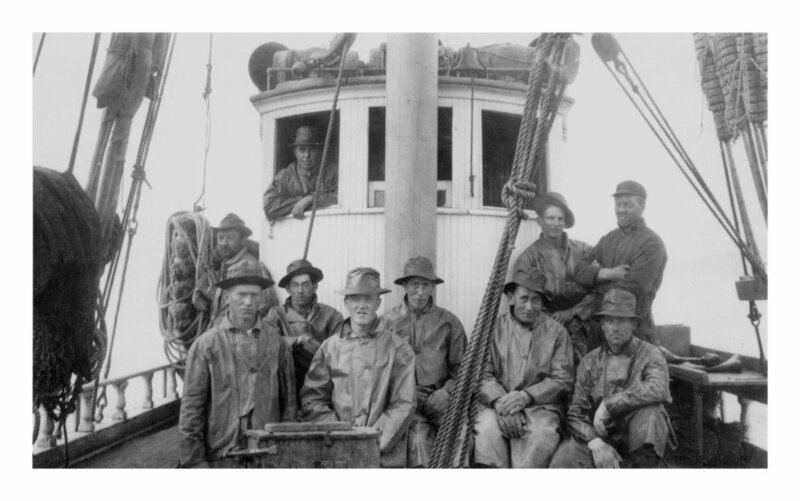 Formed in 1912, the Deep Sea Fishermen’s Union of the Pacific—referred to by friends as D.S.F.U.—was created by workingmen on Seattle’s waterfront who sought eminently practical goals: higher wages and safer working conditions. Those early days brought several strikes between D.S.F.U. and the boat owners, who formed their own organization in 1914 called the Fishing Vessel Owners Association—referred to here as Vessel Owners. Though their relationship began with conflict, these two organizations soon formed a unique labor and management relationship that has lasted 98 years. The Dory Man - Hauling! Aside from the obvious labor concerns, D.S.F.U. was one of the first organizations to blaze new trails in fishery conservation. Working hard to support the creation of the International Pacific Halibut Commission in the 1920s, D.S.F.U. and other interested groups, such as the Vessel Owners, created a self-regulating system called Limit and Layup in the 1930s. Agreed upon by the interested parties with no more regulation than a handshake, Limit and Layup allowed a boat to catch 3500 pounds per crewman. Though this agreement led to some rather large crews, it stabilized the price of halibut, encouraged conservation, and ensured employment for union members. Union fishermen went on to risk their lives during World War II by catching fish like Soupfin shark that had livers rich in vitamins A and D. These vitamins were critical for the night vision of bomber crews and long-haul convoy drivers. It was also during this time that 10 crewmen and Captain Louis Holm of the F.V. Helgeland disappeared in the Gulf of Alaska with all hands lost. Chances are the war had something to do with it. In the 1950s, to provide employment and conserve the fishery, a new lay up was created where boats would fish a week and then lay up in port for a week. D.S.F.U. worked with other participants in the industry to create the Halibut Production Control Board. Once again, a gentlemen’s agreement between the concerned parties was all that was needed to put this new lay up plan into effect. Though this attempt by D.S.F.U. to self-regulate their industry worked for many years, the agreement eventually fell victim to a Federal policy of giving ‘underutilized’ fishing quota to foreign countries. In 1962 the Bering Sea was opened to the predations of foreign trawling and longline fleets. Rising immediately to the occasion to protest were the Halibut Fishermen’s Wives Association—also called Fishermen’s Wives. Organized originally as a group of women married to skippers and crewmen that sponsored social events promoting halibut, the Fishermen’s Wives soon became the most powerful single lobbying force for the fishing industry in the United States. Led by a force of nature Fern Molvik, who was the wife of union crewman Gus Molvik, the Fishermen’s Wives helped create sister fishermen’s wives groups all the way up and down the Northwest coast. By also networking with groups as diverse as the Puget Sound & Alaska Gillnetters, the Makah Nation, the National Federation of Fishermen, the Northwest Troller’s Association, Vessel Owners and of course the other fishermen’s wives associations, the Halibut Wives successfully fought to change the international boundary of the United States from 3 miles to 12 miles. When the 12-mile limit was established, the Fishermen’s Wives kept fighting for protection of the international shelf, and holding out hope that perhaps one day a 200-mile limit exclusion zone might be created. But help was on the way. Warren Magnuson called on Harold Lokken of the Vessel Owners to develop legislation to create a 200-mile limit. Together with the Vessel Owners, D.S.F.U. successfully lobbied for the 200-mile limit to create a viable fishing industry in the United States up and down its coastline. Whether a fisherman is working out of Gloucester, Baton Rouge, or Honolulu, they can thank the D.S.F.U., the Fishermen’s Wives and Vessel Owners for the hard work on their behalf. The establishment of the 200-mile limit was a hard-fought victory but too late to save the lay up agreement established in the 1950s. Salmon fishing was failing, and salmon boats of all kinds started fishing for halibut in the late 1970s. With many more vessels fishing for halibut, fishing time for the Union men quickly decreased. Responding to new pressures in the industry, in 1982 the D.S.F.U. and Vessel Owners again joined forces to create a permit-limit fishery. In 1984 it passed the North Pacific Fishery Management Council by a vote of 9-2, but was vetoed by the White House Office of Budget & Management. Longline fishermen suffered accordingly from the lack of regulation. Though the establishment of the 200-mile limit finally allowed the United States to control the amount of fish caught in the North Pacific, thus permitting the fisheries to be conserved, the annual wages for both crewmen and boat owners were steadily dropping. The only good news was that Fishermen from the United States reclaimed the sablefish quota, which had been taken for years by the Japanese. This was done to a great extent by boats manned by D.S.F.U. crews. In 1989 a new opportunity called Individual Fishing Quotas (IFQs) arrived on the scene. The idea was simple in principle: the right to fish would be controlled by how much poundage you held. This poundage could be bought and sold, and how much you would get depended on how much your boat delivered from 1984 to 1990. The annual quota of black cod and halibut determined the value of each share. If there were more fish a quota pound might go up to 1.2 pounds, if there was less fish, a quota pound would go below a pound of quota fish. Who would be gifted the poundage proved a most painful negotiating point. While the D.S.F.U. and the Vessel Owners battled each other and other interested parties, crew shares continued to drop precipitously. In 1992, a crewman was making perhaps $20-30,000 dollars a year. After many contentious and difficult meetings, both in the Union and outside of it, D.S.F.U. voted 32-17 to back an IFQ policy that did not include the gifting of poundage to union members. The Vessel Owners, in return for the critical support of D.S.F.U., agreed to an eight-year setline agreement, starting in 1995, that would ensure the Union men received the financial benefits a seasonal fresh market guaranteed. The D.S.F.U. also successfully fought for a loan program to assist crewmen who wished to purchase quota of halibut and sablefish. Though the decision to support IFQs was heart wrenching for the Union men and still a matter of heated debate throughout the industry, the benefits that are currently being enjoyed by longliners in the North Pacific can not be ignored. The price of black cod and halibut catch quickly shot through the roof. For the first time in almost 20 years, product could be sold continuously to the fresh market from March to October. Wages went up dramatically. Better wages and the opportunity to secure the necessary loans to buy quota brought the ‘ownership society’ to D.S.F.U. crewmen. Today the Deep Sea Fishermen’s Union of the Pacific continues the hard work of fighting for the rights of crewmen working the waters of the North Pacific. In 2002, after being petitioned by crab fishermen, the Union offered crewmen on crab boats the opportunity to create their own lobbying force under the banner of D.S.F.U.. When North Pacific crab changed to IFQs in 2005, D.S.F.U. ensured that a loan program was in place to help crewmen secure the financial means to purchase quota. As we speak, D.S.F.U. is lobbying to bring a more balanced view of their concerns to the North Pacific Fishery Management Council. For over one hundred years the Deep Sea Fishermen’s Union of the Pacific has labored on behalf of its crewmen Through good times and bad, D.S.F.U. has constantly fought for higher wages and safer working conditions. Of course there’s been a strike here and there along the way, but D.S.F.U. has, aside from its work on behalf of its members, been a powerful lobbying force for the protection and conservation of its fisheries. There is only one union in the United States fighting for the rights of crewmen: the Deep Sea Fishermen’s Union of the Pacific. It has been fighting for those rights for over 100 years. Do you have photos, memories, memorabilia or names of relatives associated with D.S.F.U.? The union would appreciate hearing from you! For more information, call (206) 783-2922 or email. This article appeared in the Jan. 6, 2012 issue of the Norwegian American Weekly. To subscribe, visit SUBSCRIBE or call (800) 305-0271. 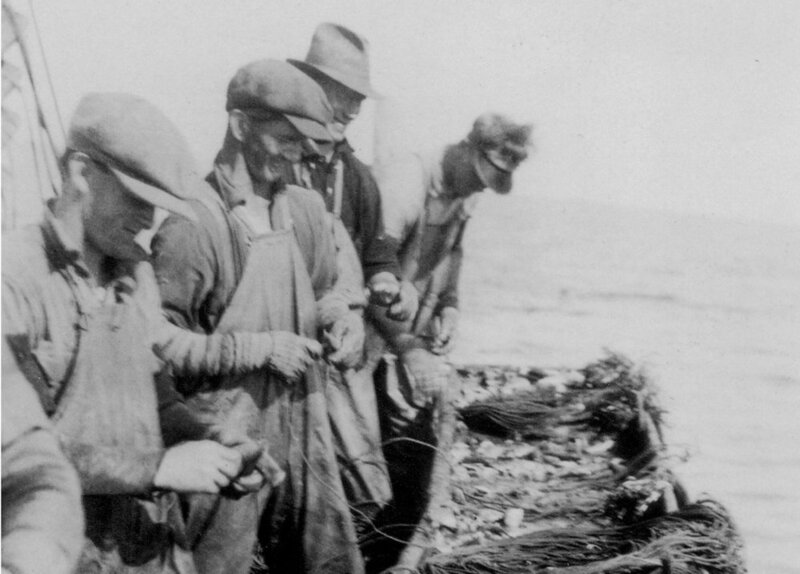 Extensive information on the history of our Union is now available in a beautiful coffee table book titled "One Hook at a Time: The History of the Deep Sea Fishermen's Union". It was published by Documentary Media, a well-known and respected publishing house in Seattle, Washington. It was printed using the Union printing house, Reynolds DeWalt from New Bedford, Massachusetts. It is 100% MADE IN THE U.S.A. Originally written by Jeff Kahrs, with additional material by Barry Provose of Documentary Media, many hours of research by Thomas Samuelsen, as well as edits, rewrites and sidebars voluntarily written by members of the Union. It is a wonderful collaborative effort. It is on sale here and at the Union office. This is a limited edition printing about our 100 plus years of fishing history that has previously never been written.